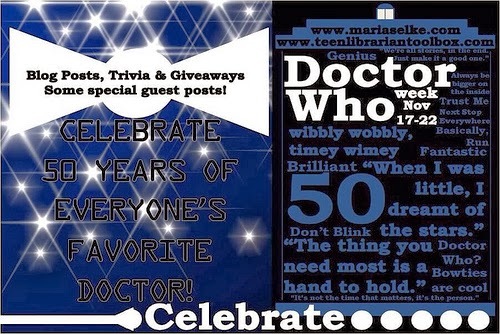 Another lovely guest post from Karen of Teen Librarian Toolbox to celebrate Doctor Who Week! I like to pretend that I am not at all romantic, but the truth is - I am in love with the idea of true love. Soul mates. Which is why I am in love with the story of Amelia Pond and Rory Williams. Their story does not have the most romantic beginning - but it has the most tragically beautiful end. An end that speaks volumes about sacrifice and yearning. It is, after all, called marriage. When we first meet Amy, she is engaged to Rory but she takes off with the Doctor. Then, for a while, you think she is in love with the Doctor. And maybe she is. I mean, she did try and kiss him. But she can't shake these feelings she has for Rory. Soon Rory is traveling with them. He waits 2,000 years to be with her, earning the name The Last Centurion. Then he is erased from her memory but she feels is if something isn't quite right. There is this niggling sometimes in her brain. Seriously, so many obstacles are thrown in their way. Amy is replaced by a Ganger. Their baby is kidnapped. And there is always the Doctor - and jealousy. At one point and time, the two are on the verge of getting a divorce. It looks like the end for my favorite couple. My heart was breaking. But then . . . Which brings us, finally, to The Angels Take Manhattan. One of my favorite story arcs. First, I love the noir way this story is told. And of course that it involves a book, a P.I. novel no less. But it is also here that we see Amy and Rory's love on full glorious display. Rory is trapped in a time loop. We have just seen him die - in fact he has just seen his older self die - having spent years alone and without Amy. The two lovers, now husband and wife who have traveled through time and space and seen unparalleled adventures, are trying to create a paradox and close a time loop. So they jump - together and in each other's arms - off of the roof of Winter Quay. The end up in a cemetary. But not the way you think. Not dead. No, they have done it. They have closed the time loop. They have created the paradox that they needed. And just as you think everything is okay, one remaining straggling angel reaches out and sends Rory back. This time, there is no easy fix. Hope seems lost. Amy's only choice is to leave Rory or to leave the Doctor. And she chooses Rory. Gah! This whole scene makes me tear up. Through a lifetime of sacrifices for each other - not always equal - Amy finally makes the one sacrifice that no one thinks she can make for Rory: she leaves the Doctor and all that comes with being his companion behind to grow old in a normal life with Rory. Now this, this is a love story. It's not smooth. It's not easy. But it tugs all the right strings on your heart. There are some YA authors who do this well, a couple that have even made me cry - I'm talking to you John Green. But nothing so far has compared - for me - to the story of Amelia Pond, her Raggedy Man and the Last Centurion.